Dr. Jason Crumpton recently participated in the Green Chemistry in Education Workshop at the University of Oregon. Karen Butler ’14 recently completed her Masters degree in Forensic Toxicology at VCU and is pursuing her PhD at North Carolina State University. Alyson Black ’16 recently accepted an invitation to join the PhD program in Pharmacology at the Medical University of South Carolina. Naomi Tice ’13 recently began a Peace Corps assignment in Armenia. 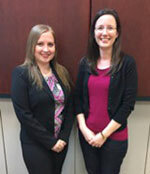 Ashley Longstreet ’10 recently defended her dissertation “Access to Polysubstituted Heterocycles and Fluorescent Indicators from a Single Enamine Class” and earned her PhD in chemistry from Florida State University and has begun a post-doctoral position at MIT. Graham Byrd ’15 recently began work as a Quality technician at Unilever, maker of popular brands Dove, Axe, Lipton, and Hellman’s. Jesse Patterson ’15 recently began the Master of Science in Forensic Science program at Virginia Commonwealth University. Jesse is the third Hornet chemistry graduate in the previous five years to be accepted into this competitive program. Jesse joins Karen Butler ‘14 and Deborah Clay ’11 as recent graduates to enter the program. Berk Ellis ’15 was recognized as the Robert Hill Distinguished senior at LC. 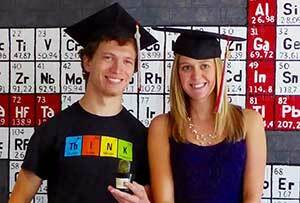 Ellis has since begun his graduate work and is pursuing a PhD in chemistry at Vanderbilt University. Josh Welfare ’16 received a Schewel grant to fund his senior honors thesis. A chemistry degree from University of Lynchburg essentially changed my life. The small classrooms and the one on one experience with the professors makes the program very rewarding yet still challenging. I especially use the skills that I learned in Analytical and Organic Chemistry in my current position, and I am grateful to have had the opportunity to take a forensic science course that spurred my interest in the subject. In addition, I have the chemistry department professors to thank for pushing me to apply to graduate school. Without their support I would probably not have pursued a Master’s degree in Forensic Science and would not have the rewarding career that I have today. Thank you University of Lynchburg faculty!